Drypoint, second state after burnishing, from the rare first published edition issued by Porcaboef on watermarked paper. A rich impression with burr printed with toned plate on cream laid paper watermarked A.Porcabeuf (sic). Impressionist painter, Berthe was a pupil of Corot (1862-68) and studied in the galleries of the Louvre, where she met Manet, she became his pupil and in 1874 she married his brother Eugene. Manet painted her in his famous work 'The Balcony' and made portraits of her in both lithograph and etching (1872-74). Renoir made her and her daughter Julie the subject of a number of paintings and etchings. Morisot exhibited in all but one of the Impressioist group exhibitions between 1874-1886. She became interested in printmaking for only a year or so around 1888. 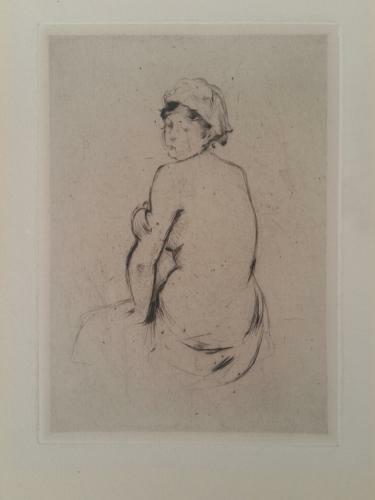 Mart Cassatt, a keen etcher had moved nearby and this may have encouraged Berthe to take up drypoint. She made eight drypoints and one lithograph. The first four drypoints were landscapes and the final four figure studies. All were based on existing drawings or paintings. Only a few proofs were pulled from her plates during her lifetime and the first formal edition of only 25 impressions was published 1904-5, for her grandson by Porcaboeuf, this edition was on paper watermarked 'A Porcabeuf (sic), there was a further edition of 25 (not on watermarked paper) before Vollard acquired the plates for an edition of 250 on cancelled plates. The plates were cancelled by having a hole drilled top and bottonm which printed as two small circles.